For this week’s Writing Conversation, and to mark the publishing of a new limited-edition of In the Stillness Dancing —the journey of John Main, we are putting up this extract. This is chapter 11 and John Main has reached the point of establishing an entirely new monastery in the vital North American city of Montreal — at that time a city and society going through politically tumultuous times with the rise of Quebecois nationalism right into government and the ongoing cultural aftershocks of the 1960’s. ‘The whole thing here is a complete leap in the dark.’ That was how Father John described the Montreal project, and that was literally how it began. After their flight from London, Father John and Brother Laurence Freeman arrived in the evening at Mirabel Airport outside Montreal, in the rain and in the dark. The man who had so much to do with their coming, Bishop Leonard Crowley, was at the airport to meet them. The meeting almost ended in a fiasco. Father John had left Ealing in a rush. T-shirts had been jammed into a bulging brief-case secured with the only fastener at hand, the belt from his trousers. This precarious arrangement withstood the pressures of the transatlantic flight. Unfortunately, at Mirabel airport, as Father John, beltless, stretched out his hand to meet his new bishop, the bulging brief-case burst open. Happily Father John’s trousers held firm; so did his remarkable composure. It is impossible to say what opportunities there will be for us or how the whole thing will take on. But basically I think the only important thing is that we are a group who want to pray together and to respond to the needs of the kingdom as they appear. The needs of the kingdom, as they appeared, were mundane indeed. They related to the house John Main had purchased, with the Bishop’s help (virtually the only money the two Benedictines had was in their pockets) on Vendôme Avenue in the municipality of Notre-Dame-de-Grace near downtown Montreal. It was one of the historic Décarie houses, built by the descendants of Jean Décarie, who had come out from France about 1650 when Paul de Chomedey, Sieur de Maisonneuve, was trying to develop what would become the city of Montreal. But the house had fallen into a state of disrepair and there were other problems, as Father John explained to Lady Lovat about a month after arriving in Montreal: ‘ . . . we are still not able to get legal possession and wait, like orphans, on the doorstep’. I can well understand your reservations about leaving Washington and of course I must in no way encourage you to desert what you see as your responsibilities. I understand your dilemma well because I went through the same at Ealing over the years. It may be that you will come (because the circumstances are different) to a conclusion different from mine. But whatever your decision rest assured that I will respect and understand it. Whatever you do decide I hope that you will come and visit us here from time to time. We shall be very poor! We have been given $57,000 in gifts and loans which will cover the cost of purchasing the house ($47,000) and some money for repairs and renovations. We will have to furnish from scrap and equip! We have $25,000 a year to live on, but the cost of living seems very high here and we will need to watch the way we spend. This I think will be a good thing for us all. Bishop Crowley was responsible for the financial support of the new Benedictine foundation. The Bishop was very gratified by the generous response particularly of Quebec’s religious communities, including the French ones. Even Abbot Rossiter, at a time when Ealing could ill spare the money, sent Father John an ample donation. Some friends of mine came and took me off ‘snow-shoeing’ the other day — it was a sort of kidnap! But I enjoyed it immensely. We walked over a lake (frozen!) and through some pine woods, all in about three feet of snow and the deepest silence you have heard — really inspiring. I made a resolution to go snow-shoeing whenever I can. I am delighted you have joined Fr Vincent’s group and I know that nothing will deflect you from fidelity to the simplicity of the mantra. Other teachers think it is useful to keep up the interest of the group with various things. I am sure that this is good provided it doesn’t compromise the main issue. There is really nothing to be learned — nothing to experience or anything like that. It is simply a matter of realization — we must realize who we are — in Jesus. The rest is really so much froth — but people do get a bit restless if you merely repeat, ‘Say your Mantra’, and so teachers think of all sorts of other techniques and clever things to say and so on. The only thing is to open your heart to the love of the Lord Jesus and the only way I know to do it is to be simply faithful to the mantra day by day. ‘I am so glad that things are going well at Ealing….It is often the case that things turn out that way. I think that my going made it possible. There is no doubt but that this is the Lord’s doing.’ ‘I think that my going made it possible’: no looking back in bitterness or regret at what might have been; but looking forward with enthusiasm to what would be. We have now established our full round of monastic prayer and it has been a great joy to return to the regular life. . . . Of course we have our problems to get everyone entirely together, but the uniting factor is the commitment of everyone to the prayer together. Seen here at the Vendôme priory – Laurence Freeman, the Dalai Lama, John Main. Learning to meditate is the most practical thing in the world. You require only one quality when you begin. That is seriously to want to learn to meditate. The process is absolute simplicity…. You need to find a quiet place . . . and, having found it, you sit down. . . . When you are seated and are still, you close your eyes and then begin to repeat, interiorly and silently in your heart, the word Maranatha (‘Come, Lord Jesus’). In some traditions this is called a ‘mantra’, in others, a ‘Prayer phrase’ or ‘Prayer word’ . . . [Maranatha] is an Aramaic word and its importance is both that it is one of the most ancient prayers there is and that it possesses the right sound to bring us to the silence and stillness necessary for meditation. . . . And that is all you need to know in order to meditate. You have a word, and you say your word, and you remain still. When anyone asked Father John about progress in meditation he would reply, with a smile, that the first 20 years were the most difficult. Nor did he ever suggest, or even imply, that meditators formed some kind of spiritual elite. He once referred to a Tuesday night group (including himself) as ‘this motley crew’ and he told Michael Hall, ‘We are really a very ordinary group doing a very ordinary sort of job! As if you did not know.’ During the early months of 1978, the outlines of‘the very ordinary group’ at the Vendôme Priory were clearer. It comprised three levels: the monastic community, still only two, Father John himself and Brother Laurence Freeman; the lay community, then three young men from England and two women (a nurse, Pat Hawes, and Sister Eileen Byrne); and finally the meditation groups. We don’t get much news from Washington. . . . Do write when you have a moment and give all your news. I hear very little from Ealing and so have little word of them. We hope that Vincent will come to join us here but the Abbot seems a little uncertain about it. Our plans go ahead here and we are now coming within sight of our dream — that is a community of monks, sisters, lay community and married people and families — all joined together by meditation — obviously at different levels of commitment but each with a growing commitment. In this society of entertainment and spiritual eclecticism, but marked, too, by so much genuine concern for a true experience of absolute value, it seemed to me that the monastic witness of the kind we were making in Montreal was of supreme importance — simply to prove to a culture built to such an extent on ‘conditional discipleship’ that only the absolute commitment can bring the liberation they seek and so often do not find. He would point out how there existed, in Baroque music, a relationship between the musical pulsings and the duration of a breath in a human at relaxation. Thus the music corresponded to a rhythmic harmony in humans, making it suitable for relaxation, attentive appreciation and even digestion. He felt that the Haydn Symphonies and the Mozart Concertos were ideal vehicles to listen to at meal times given their structure and length, about 25 minutes. In regards the format of your meetings, we have found that the talk time should not be more than 15 minutes and ideally only 5-7 or so. I think the rest of your format is good. Assemble — listen to talk — meditate — discuss. I think it important to stress that the discussion should not be on ‘what happened’ but on more practical things like good time, good reading, good posture, etc. etc. As regards reading. In the initial stages the less the better. Advise against getting into too many technicalities. About teaching others. As long as you are scrupulously honest and only try to teach what you know and don’t mind saying ‘I don’t know the answer to that’, I would say start a group wherever you can. You can always use some tapes for the initial stages. The important thing is to meditate. I think a weekly meeting of the group is of enormous help if it can possibly be managed. It’s very good I think to be in touch with a Community and feel absolutely welcome to be in touch with ours. Anytime you want to write or anyone wants to come and stay (The Maple Leaf fare is quite cheap!) you will always be welcome. . . . The Community dimension is important because it does provide a point of reference for you that gives confidence to your group. This is the idea behind our newsletters. . . . Our work is expanding quite rapidly here and in all sorts of places in the world. It has been staggeringly beautiful here for the last weeks. A very slow Fall with the leaves getting more and more unbelievable — reality is really so much more fantastic than fantasy — or as someone said Nature does really imitate art. We have a tree at the entrance to our drive that has looked like an old lady growing gracefully and more and more beautifully old — starting with full reds going to light browns, then to golds and then to frail spun gold. By the close of the first full year at the Vendôme Priory, the structure of the new foundation, still fragile, was becoming more firm. At the end of 1978, the Priory received its first oblate, Rosie Lovat. The big problem, as the new year began, was not lack of activity but lack of space. Harry’s death must have been so hard for you as I know how much he relied on you. I loved him very much — he was really such an important figure in my life. Only during these last days have I realized how much. I think he gave me almost all the confidence I have! Isn’t it strange and I don’t think I have known that clearly all my life. I shall always keep him in my heart and daily remember him in the Mass that meant so much to him in recent years. I think it must have been that I saw his faults clearer than my father’s, and his faults somehow made him greater in my eyes — there was something generous there that was very attractive. I was so delighted to get your letter and very moved as I read it. It is so curious that we share so much in spirit. Could it have been those early genetic meetings in the pre-first-World-War Brussels that gave us such an affinity? But whatever it is it is extraordinary. Perhaps it was environment — a people is made a people by its early memory — and I suppose we were both in our own way affected by those brief years or was it months in W.G.C. [Welwyn Garden City]. Whatever the explanation, the affection of those teen-aged years at W.G.C. ripened into love and then into a selfless service to others, Diana, a doctor in the practice of healing, John, a monk teaching meditation, a service that subsumed their own love but did not extinguish it. Your union and communion ideas are perfectly sound, ‘How can you say you love God who you cannot see if you do not love your neighbour who you can see?’ (St John). Love of neighbour is the perfect preparation for prayer (loss of self in God) and prayer is the perfect preparation for love of neighbour (loss of self in others). It is sternness and the ability to encounter it without fear that is the beginning of love. The wonderful thing about meditation is that it prevents all fooling around with religion. If you really want to say your mantra then you can harbour [no] resentment and irritation in your heart. That is not to say that you won’t feel it! At least from time to time — but as soon as it presents itself it must be banished. The beauty of it is that it is banished not by our will but by God’s Love. Father John had enjoyed good health in Montreal. But a medical problem emerged in the late summer of 1979. After giving a retreat to the sisters of the Congregation of Notre Dame at Mabu in Nova Scotia, followed by a brief sea-shore holiday, he returned to the Priory. He first noticed pains in his lower abdomen in September. They became worse. A doctor at the Queen Elizabeth Hospital diagnosed cancer of the upper bowel. How lovely it was talking to you on the ‘phone’. I was so sorry to give you bad news but I didn’t want you just to hear it third-hand. It is apparently quite a serious operation — the doctors say — serious but not grave!! [No matter what the circumstances Father John could seldom resist his proclivity for punning].
. . . It’s strange how suddenly this illness has developed! I haven’t quite got used to the idea of it yet. But I feel very calm and am totally open to God’s will whether it be life or death. I hope I will be able to say the mantra throughout the uncomfortable bits of it. Keep me in your heart. The beauty of meditation is the real simplicity it leads you to — a real capacity to respond to what IS. Douglas had not written for a long while. I found myself awake several nights running, acutely anxious about him and with him in my thoughts I then wrote a (relatively) angry letter, in funny vein, saying that only a brain tumour would do as an excuse for not writing. This is just to give you a bad conscience!! But not too bad!! But I am just recovering (2 days out of hospital) from major surgery. Was quite ill for a few weeks. Growth in bowel — seems to be a great success — no infection in lymph nodes. Will write as soon as I am stronger. Much love. Douglas. I got through to him immediately and his feelings, usually so carefully covered (indeed virtually always) were revealed by a strained voice, ‘So you do care after all.’ He made light of the hard times in his life and wrote of the successes and highlights. Forgive my prolonged silence, but I have put all my energy into recovering from the surgery. It seems to have worked. I am now back to full health! Blood – all sets of tests — including haemo or is it heamo-globins or whatever, all counting perfectly, pressure fine and weight back to a somewhat portly 190 lbs which is what it always has been for several years now. There is the true self (Atman) which is Christ, in him, with him and through him we are in God (Brahman). There is the false self (Ego) which has no reality and does not exist — it is only illusion. The false self burns away and gives way to the true self in the fire of Divine Love who is Christ. ‘My me is God; neither do I know myself save in him’ (Catherine of Genoa). In other words there is only God — he is the one supreme reality. We can only know him with his own self-knowledge which is the life of the Trinity. Our intention is to leave illusion — to leave unreality — God’s call is to leave the ‘I’ and become ‘me’. We must all become ‘me’. I hope that clarifies rather than obfuscates. After what he described as ‘a splendid rest’, Father John and Laurence returned to Vendôme to an intense round of engagements. They flew to Victoria, British Columbia, at the invitation of Bishop Remi de Roo to give a week’s series of talks in the cathedral. The crowds were large and enthusiastic. Back home the whole community was busy preparing for Laurence’s ordination. As Father John wrote to Rosie: ‘Laurence is really very excited but playing it cool!’ In June in the lovely chapel of the motherhouse of the sisters of the Congregation of Notre Dame, Bishop Leonard Crowley ordained Laurence Freeman OSB to the priesthood. This was the climax of Laurence’s successful studies in theology at the University of Montreal. I had a lovely letter from the Archbishop of Canterbury saying how much he had enjoyed ‘The Other Centeredness of Mary’. He said that he was due to preach at Walsingham soon and that it had stimulated him in preparing his sermon. It was a very warm and friendly letter. Some of them I think got the message of meditation but by no means all. I am now with a group of Dominican Sisters and I have the impression that they may be more on the wave-length. Ireland was damply beautiful and I enjoyed the two retreats which were really restful for me. In each of the Communities there were two or three who really understood and who will tread the pilgrimage to the end. This is a great grace.
. . . let me tell you what I feel about suffering. There are situations in life that are so unbearable that only terrible violence seems able to bring relief and deliverance. The Cross itself is the archetypal instance. When such violence seizes hold of people they act only out of the narrowness of their violence and not out of the fullness of their humanity. Hence the ‘Father forgive them they know not what they do’. Forgiving really does mean unremembering – letting go all remembrance of the violence and allowing only the full humanity to be. I am so delighted to hear that meditation has meant so much to you. There is great healing in it. As you become more quiet and go deeper into the mystery of God you begin to understand that the mystery is of the infinite depths of the Divine Love which is absolutely all-sufficing. You begin to understand that you don’t have to live out of your own limited resources but out of the infinite compassion of God. What was also ‘absolutely wonderful’, at a different level, was the news about a new site for the Priory (which the previous summer had transferred its affiliation from Ealing to Mount Saviour in New York State.) With the assistance of Montreal businessman, Jean Prieur, Father John started to search for a larger property. Then, almost miraculously, came the possibility of acquiring one of the most spectacular mansions in a city famous for them. The story of how the McConnell estate became the Benedictine Priory is an astonishing one. On his way back from a trip to England, Father Laurence met a middle-aged couple on their way to Montreal. They seemed interested in meditation so he told them about the Priory. Later, their daughter spoke about Father John and meditation to a friend, David Laing, son of Mrs Peter (Kit) Laing who, in turn, was the daughter of the late J. W. McConnell, a prominent Montrealer who had once owned one of Canada’s most respected newspapers, the Montreal Star. David Laing, an engaging young man with nervous prob­lems, began going to the Priory to meditate. Later he had several discussions with Father John who gave him some clear-cut advice. David learned that the Priory desperately needed more space. He casually remarked to Father John that his family owned a house in downtown Montreal. (Jean Prieur had also learned that the house was available.) Just as casually Father John went with David Laing to look at the house with its palatial terraces, turrets, court yards and tennis courts. It was situated in a wooded estate above Pine Avenue half-way up the magnificent Mount Royal with a breathtaking view of Montreal down to the St Lawrence River and beyond to the green hills of Vermont. This was the McConnell mansion (with its eighteen bedrooms and a spacious coachhouse), one of the half dozen most celebrated homes in Montreal. Father John realized immediately the house would be ideal as a Priory because of its secluded environs and central location. But was it a real possibility? Father John invited ‘Kit’ Laing for tea at Vendôme. To his delight and surprise (the McConnells were from a staunch Protestant background), he learned that ‘Kit’ Laing favoured her old home (now used mainly for social events) becoming a Benedictine Priory. But she was just one member (albeit the president) of the foundation that controlled the estate. What would they say? In their discussions one gentleman asked Father John, ‘And how long have you been around?’ ‘About 1,500 years,’ Father John replied. Out of the blue we have been offered a very large house on Pine Avenue (downtown) as a gift. Unfortunately they were about to sell the gardens for a considerable sum to a developer. As this would make the house useless for us I told them that I couldn’t really accept the House for the Community unless they gave me the land too! They are now considering this and I am waiting to hear from them. It would be a very good interim solution. After [the retreat] was over I went down to visit some friends in Southern Missouri who have a lovely house on the North Fork River, a tributary of the Missouri River. While there I did some white water canoeing! It was great fun shooting the rapids at high speed — we only came out once! You soon learn at that speed. Shortly after his return to the Priory from St Louis, Father John was delighted to welcome a new member to the monastic community. Paul Geraghty, a young solicitor, 26 years old, from Liverpool, had spent about six months at the Vendôme Priory in 1978. For some years he had been thinking of the monastic life. As early as 1975 Paul had gone to see Abbot Francis Rossiter at Ealing. The Abbot suggested he talk with Father John who was guest-master at the time. Later, in 1975, Paul joined Father John’s meditation groups at Ealing. After his stay at Vendôme in 1978, he returned to Liverpool to practise law, then, when family responsibilities permitted, he returned in October 1980, a shy, extremely capable and like­able young man, a solid addition to the monastic community. He arrived just in time for the big move and also to help welcome the most notable visitor of the year, the Dalai Lama, spiritual leader of the Tibetan Buddhists. We meditated together in absolute openness to love and to the Lord of love. We were not trying to convert one another. Our challenge as Christians is not to try to convert people around us to our way of belief but to love them, to be ourselves living incarnations of what we believe, to live what we believe and to love what we believe. Just to let you know that the donation of the house is now complete. The Board met last week and confirmed that they would give us everything – house, land and furnishings. They have given us November 1st as our date of entry. So you will be able to be with us as we start this new chapter in our history. The beginning of ‘this new chapter in our history’, the move itself, helped by many friends from the Priory, went off smoothly and was embellished by a typical John Main inci­dent. Father John, like the lay community and other helpers, was wearing working clothes. A man living nearby was watching this moving crew in action. He asked whom they worked for. Father John replied, ‘The National Moving Company.’ Could they move a sideboard to his nearby home in Westmount? They could and they did. Could they move another piece of furniture downstairs? Father John replied they had to get back for Vespers (‘which apparently he thought were some kind of Italian motorcycle’). I have been postponing writing to you so that I could send you a worthy closely argued treatise on reflections on life now that I am in the mid-fifties! But in case I never get around to that I am sending you this brief bearer of loving tidings. Life has been full. Had my first experience of talking to a large crowd — 8,000 — in the Anaheim Convention Centre outside Los Angeles. After that took part in some ‘conventions’ in San Diego. I can’t understand why everyone in the world doesn’t live it up in Southern California. empathy more than surrender. Empathy is perfect reci­procity — our dear and courteous Lord invites us to this. Surrender suggests a power of struggle but the essence is pure gift — God gives himself to us and we enter into the fullness of his gift — this is empathy. It puts God and ourselves in a much truer light than surrender — surrender seems to lessen the marvel of his courtesy. . . .
At the end of course it is all words — but some words reflect the reality a little more clearly — empathy is a bit better than surrender. . . . I hope I have answered all your questions. Oh yes, there must be no desire for God — rest in him — do not want to possess him. Be still. Desire is not in itself desirable. Desire suggests distance. Jesus tells us that he is with us. More words of course but desire for God is a confusing concept. Realize do not desire. On Good Friday for the first time an Anglican Bishop presided at the Liturgy of the Word and the Veneration of the Cross and then I presided at the Liturgy of the Eucharist. We had broken Henry Hill into the Liturgical Function when he helped with the washing of the feet on Maundy Thursday. A very inspiring time. About illusions and reality. I think the truth goes something like this. Of course you are right. Reality is everywhere — we have no monopoly of it in Montreal. What I think may be the case, however, is that reality comes in to somewhat sharper focus when you tread the path with the sort of attention we are blessed to enjoy here. It is not only the quiet of the place but the single-mindedness of all those who are here and who come here. Does that sound reasonable? I am away in Cotuit on Cape Cod and really enjoying a week of complete change and rest. It is beautiful weather — frosty mornings and bright sunny afternoons with the magnificent Fall foliage brilliant in the sunshine. Yesterday I was on Nantucket Island for the day. Our work is expanding every week and we are kept busy. Yesterday we had the entire Anglican Hierarchy of four Archbishops and 40 bishops with us for the afternoon. Today we have 14 High School kids from Ontario and the next day a group of Buddhists from Vermont USA!! We are truly catholic. There is no doubt the Community in Montreal, less than four years old, was thriving on a number of levels. But with the progress and the success there were problems and difficulties. Some of these could be traced to the personality and leader­ship of John Main himself. The end of chapter 11. 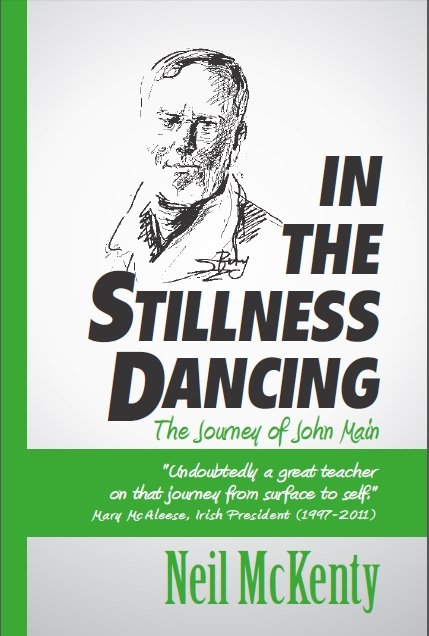 The new edition of In the Stillness Dancing — the Journey of John Main is available to pre-order. Send an email to linesarestillblazing@gmail.com to reserve a copy.